new perspective of sports, parties, and family events with a built-in camera that captures sharp, vivid 2.7K HD video and 12 megapixel photos. Full control is in your hands with a remote controller built specifically for the Phantom 3 Standard. Precise control sticks command flight, while a dial lets you tilt the camera to see more. With a built-in rechargeable battery, a clamp to hold your mobile device, and a range extender for up to ½ mile (1km) range, this powerful remote makes flying easy and fun. at what altitude you are, and it alerts you when it's time to head back. This information is streamed live to the GO app on your mobile device. 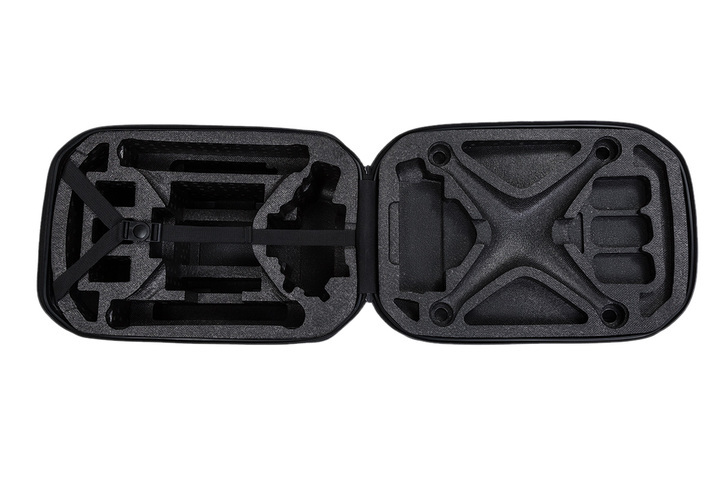 The black Hardshell Backpack for Phantom 3 is a water-resistant storage and transport solution with custom foam interior designed specifically to fit either the Phantom 3. The case features a zippered closure and there is an interior strap to hold the aircraft securely in place when opening the it in a horizontal position. In addition to the Phantom 3 the case will accommodate the radio controller (transmitter), up to three batteries plus battery charger, and a set of four propellers. How is the Phantom 3 Standard different from the Phantom 2 Vision or Vision+? Where can I get the DJI GO app? The DJI GO app is free to download from the Apple App Store and Google Play*. Search for “DJI GO” and download/install the app as usual. How do I connect to the DJI GO app? What do the switches on the top of the remote controller do? What app should I use with my Phantom 3 Standard? The DJI GO app is only compatible with devices running iOS 8.0 or later or Android v4.1.2 or later. A full list of suggested devices can be found on the Phantom 3 Standard webpage at DJI.com. How do I change the control mode of my Phantom 3 Standard? Can I use a Phantom 3 Professional/Advanced Intelligent Flight Battery with the Phantom 3 Standard? My Phantom 3 Standard does not turn off right away, is something wrong? What is the Phantom 3 Standard’s maximum flight time? Why is the number of discharges for the Intelligent Flight Battery not zero, even though I have never used it? How can I safely operate the aircraft when encountering compass error?